Here at Thames Valley, we know that there are as many different designs of control panel as there are businesses using them. How your control panel will work will depend on the requirements of your operation, including the safety measures and versatility of function needed. Our service includes the complete design, manufacture and installation of control panels made to fit your business requirements. This means that we’ll work with you closely every step of the way to ensure that you’ve got exactly what you need. If the requirements or parameters of your operation change over time, you’ll probably need to change your control panel accordingly. Similarly, over time control panels can become worn and inefficient like any other equipment. 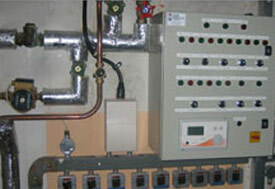 We provide a full overhaul and modification services for a range of control panels. Are your control systems not operating properly? If this is the case, you can lose time, money and even be at risk. This being said, it’s not a good idea to fully replace a system just because of a fault. Call us today to learn more about our professional fault finding and diagnostic services, designed to make your systems work more efficiently.